In-depth exploration of Cambodia's highlights and culture. 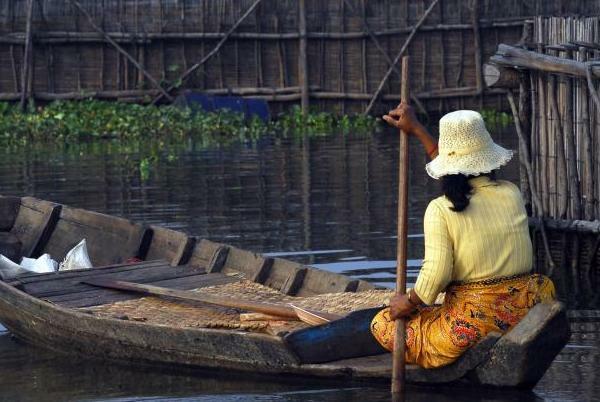 Wander through ancient ruins recently accessible to the public, cruise on the large Tonle Sap Lake and get a glimpse of local life along its shores. 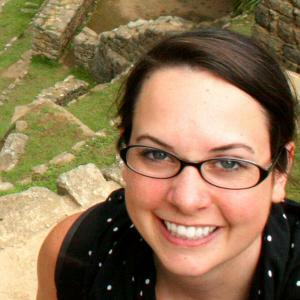 Encounter this small yet rich nation on an introductory tour and connect with the warm and welcoming people. 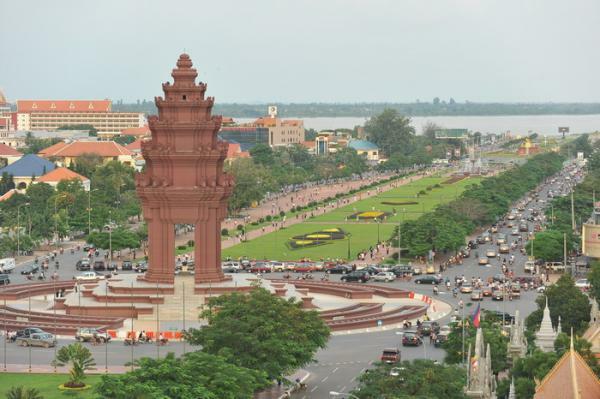 Arrive to Phnom Penh where you are met by your guide and transfer to your hotel for a leisurely evening. 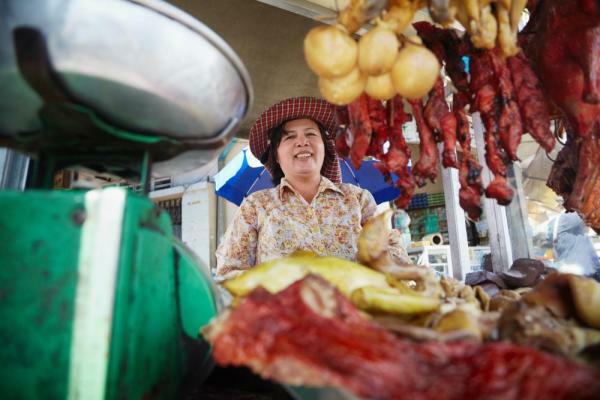 Once considered one of the most beautiful cities in the Orient, the bustling city still retains its colonial charm and picturesque location along the confluence of the Mekong and Tonlé Sap rivers. This morning you set out to visit some of the sights of Phnom Penh by cyclo (rickshaw), a traditional way to explore the city. Visit first Wat Phnom temple, the founding place of the city on a small hill. Continue on to the Royal Palace which dates back to 1866. Here you will find the Silver Pagoda, named as such for its over 5,000 heavy silver tiles covering its floors. This temple also houses a collection of Buddhas in gold, silver, crystal and bronze. Next stop in at the National Museum which houses the world's foremost collection of Khmer artifacts from the 4th to 13th centuries. The museum, built in traditional Khmer style itself, displays over 5,000 pieces and constitutes the repository of the Kingdom's cultural wealth. This afternoon take some time to learn about a more somber and dark spot in Cambodia's recent history. Visit the Tuol Sleng Genocide Museum, housed in the former school that was used by the Khmer Rouge as a detention and torture center. Also visit the Killing Fields of Choeung Ek and learn about the systematic executions that took place in this solemn place. Return to Phnom Penh this evening. Set out early today to first visit Wat Botum, one of Phnom Penh's five original wats founded in 1422. The compound here displays many decorated stupas some of which contain the ashes of their royalty. This temple is the seat of the Thammayut (royalist) Buddhist sect, the smaller of the two main Buddhist sects in Cambodia. Here monks perform a private blessing ceremony for you, wishing you health and a safe journey in a special experience. Later this morning set out to learn about the art of Khmer cuisine with a hands-on cooking course. Accompany your chef through the local market first to learn about the various fruits, vegetables, and spices used in traditional cuisine. Learn about the vast array of colors, smells, and tastes and return to the school where you prepare your own traditional dish for lunch under the guidance of the chef. Travel an hour this afternoon over scenic back roads to Cambodia's former capital, Oudong. Pass by rural villages, rice paddies, and local pagodas. Here you visit a family that produces palm sugar in their home and later climb the stupa-filled hill of Oudong for great views over the rural plains. 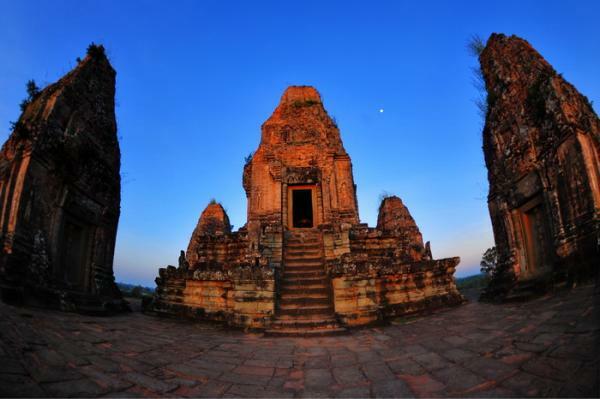 Travel by private vehicle over scenic back roads to Cambodia’s former capital, Oudong, about 39km from Phnom Penh. You will pass rural villages, local pagodas, and scenic rice paddies before reaching the main hill of Oudong. Visit a family that is producing palm sugar at their house. Later on, climb to the top of the stupa-filled hill of Oudong for great views over the rural plains. Visit as well the Vipassana Dhura Buddhist Meditation Center where you learn more about the school of Vipassana (or Insight Meditation). See as well the jade Buddha, mummified monk, and brightly painted walls here that tell the epic Sanskrit story of the Ramayana. Enjoy a leisurely morning before you transfer to your hotel for your flight on to Siem Reap, the country's base for exploring the fabled temples of Angkor, the ancient capital of the Khmer Empire. Arrive here where you are met and transfer to your hotel for check in early afternoon. After breakfast, visit the ancient city of Angkor Thom, the last capital of the Great Khmer Empire under the reign of Jayavarman VII. Surrounded by a 26 ft (8m) high wall, the city is a perfect square. Enter through the stone South gate to an entrance with a row of 54 gods or demons holding the sacred Naga snake. From here continue to Bayon Temple in the center of the city. With 54 towers and four faces, this monument represented the 54 provinces of the then Great Khmer Empire. See as well the Terrace of the Elephants and Leper King who both offer bas-reliefs. This afternoon explore the temples of the Small Circuit, the most illustrious of which is Ta Prohm which was built in the mid 12th to early 13th centuries. Ta Prohm was largely left as it was found, with overgrown jungle trees and vines causing many parts of the temple to crumble to the ground. The picturesque ruins very much live up to their portrayal in the film Tomb Raider. 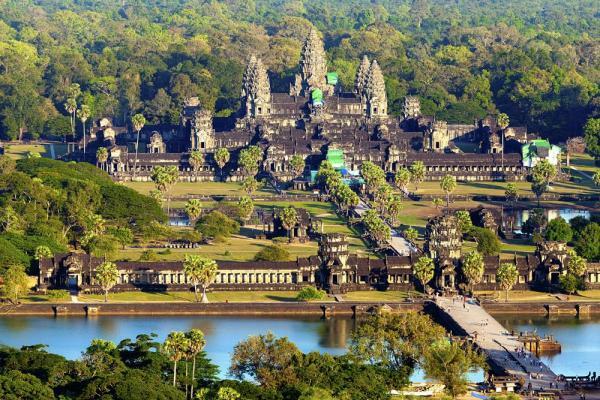 Lastly today visit Angkor Wat before sunset time, when this most popular spot is less visited by tourist crowds. Built during the reign of King Suryavarman II in the early 12th century, the city was constructed modeling Mount Meru, or the home of the gods. The divine residence of Vishnu, the King himself was said to reside here after his death. Inside the temple, walls are covered with stone carvings and bas-reliefs that depict Hindu mythology and wars Suryavarman II fought during his reign. Angkor Wat is also well known for the more than 2,000 Aspara dancers that decorate the temple. Construction is thought to have taken around 30 years of intensive labor and today a depiction of Angkor Wat is said to symbolize the soul of the Khmer people. Explore the ruins before returning to your hotel later this evening. Today drive out to the countryside to the quiet Beng Mealea, located about 40 miles/65 km outside of Siem Reap. Take a short walk through the jungle to find a completely overgrown temple. Undiscovered for centuries, Beng Mealea has only recently been made accessible and remains as it was found with no restoration work being completed. Take the opportunity to climb and crawl through this unique temple. Enjoylunch at a local restaurant near the ruin site. 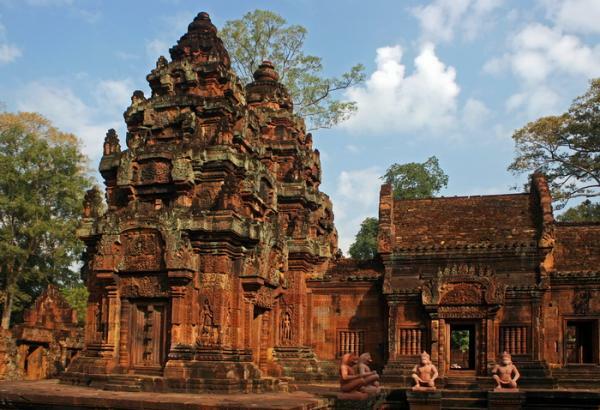 Continue your travels to the Angkor area and the temple of Banteay Srey. This "Citadel of the Women" was built between the 11th and 13th centuries and remains the best preserved temple in all of Cambodia. This temple displays some of the finest examples of classical Khmer art and is noted for its fine bas-reliefs. Banteay Srey is also uniquely covered in a pink sandstone not seen elsewhere in Angkor. 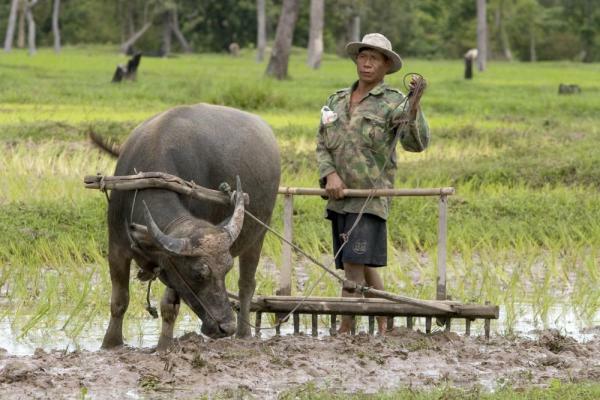 On your way back to Siem Reap take opportunities to enjoy local communities along the way. Interact with the locals with the help of your guide, and learn about the way of life here in the countryside. See how rice paper is made and taste some palm wine or sugar which are popular local products. This morning drive and boat ride to explore Kampong Kleang village. Imagine wooden houses on 32 foot (10m) tall stilts, surrounded by water in the wet season and on the flood plains of the lake in the dry season. Drive on the dirt road to the village along the way you will see many wooden houses and traditional fishing equipment as well as small children wave their hands and say hello to you. Upon arrival at the stilt house the family welcomes you with some tea and coffee before you start walking around the village. This community of Kampong Kleang knows many inventive ways to catch fish. We learn about the village life while visiting a local school, see the smoking of catfish, and speaking to a fisherman while he is making reparations on his net. Back to Siem Reap town for lunch at local restaurant. Enjoy the rest of the day at your leisure. *Boat trip is only possible from Aug to Feb when the water levels are high enough. 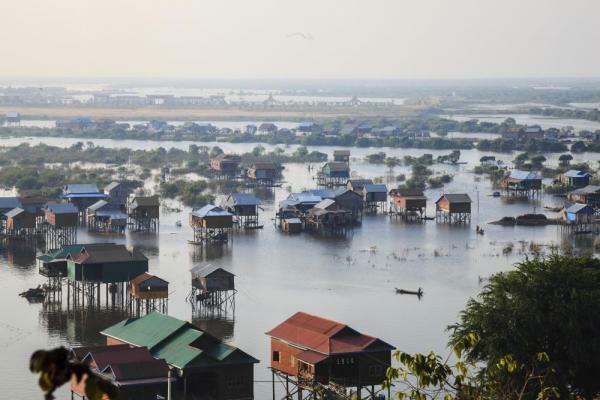 An alternate floating village of Chong Kneas may be arranged in Mar and Jul. Drive to the airport today for your return flight home.